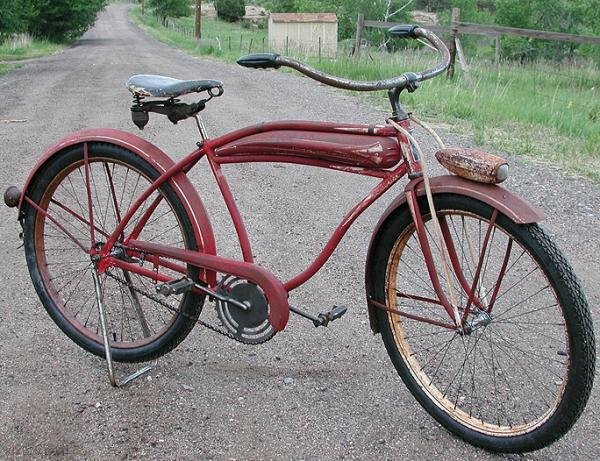 This is a 1940-1941 Antique Sears Elgin Special Deluxe Tank Bicycle. 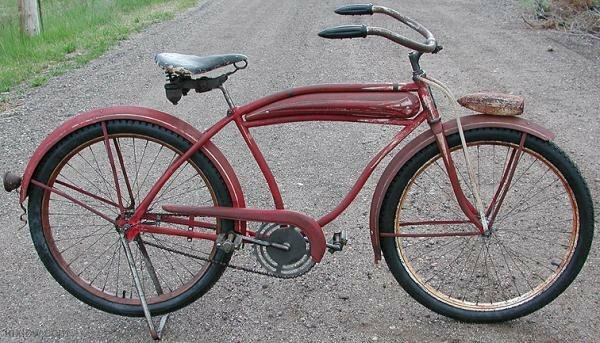 Elgin was the Brand Name of the Bicycles sold by Sears Department Stores before World War 2. 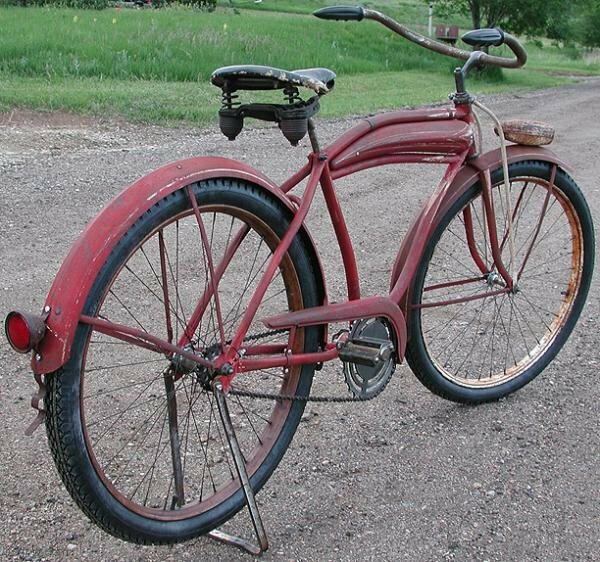 Elgin Bicycles are Unique and Sought After By Collectors and their Uniqueness helped to Rival the Sales Away From the Bicycle Giant Arnold Schwinn Bicycles. This Particular Elgin is a 1940-1941 and was Manufactured By Columbia / Westfield Manufacturing. 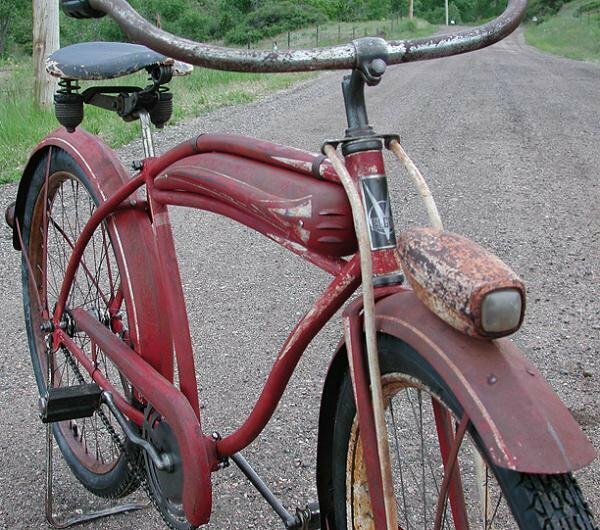 This is a Stylish, Vintage, Prewar, Cruiser Bike with Excellent Patina having a Unique and RARE Tank (I have never seen a Hanging Tank before), Deluxe Struts, Gothic Fenders, ChainGuard, and a Deluxe Saddle with a Reversed Seat Post giving it a Laid Back Cruiser Flow. It also has a Delta Winner Light and a Tail Light Reflector. The Bicycle has a rear New Departure Model D Coaster Brake and Both Hubs are Rebuilt. The Wheels are Painted Drop Center Rims and have New Goodyear pattern Ballooner Tires. The Drivetrain is the Unique 1 inch pitch chain, AKA Skiptooth Chain and has a Cool Rear Drop Stand Kickstand. 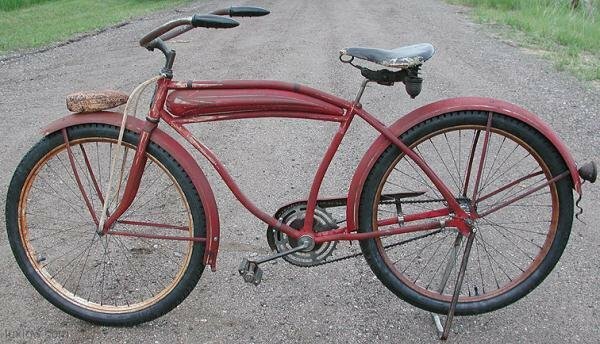 This Elgin is a Full-Size Mens Adult Ballooner Bike with 26″x 2.125 Black wall tires. 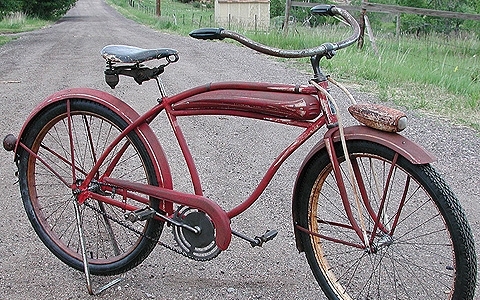 Elgin’s are Comfortable, Cool, Cruiser Bikes having a long Flowing Design. The Elgins are Cooler than Schwinn Cruiser Bikes in My Opinion.